Is It Time For Santa? | Integrated Wealth Strategies, Inc. So far it’s been rough for stocks in December, a month that has historically been bullish. How bad has it been? After 10 trading days, we’re off to the worst start to December since 1980! In fact, the S&P 500 Index is flirting with “worst month of 2018” status, currently held by October (-6.9%). Since 1957, when the S&P 500 started in its current form of roughly 500 stocks, December has never been the worst month of the year. Is there still time for a Santa Claus rally? “December has been a month to forget for equities so far, but there is a silver lining. 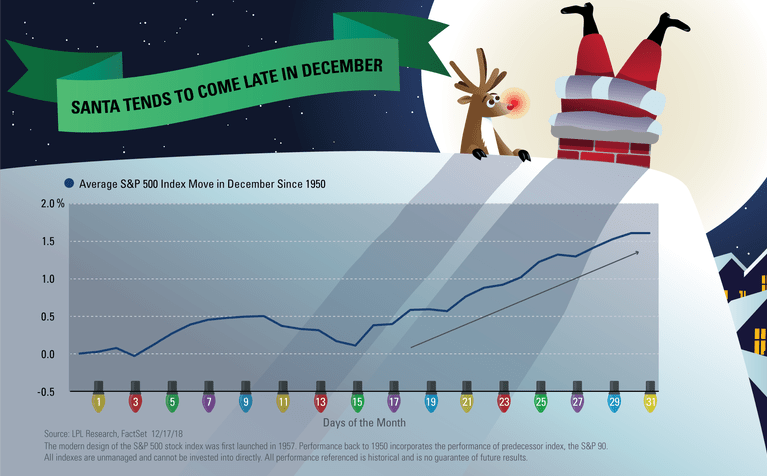 Turns out, the majority of December’s gains tend to happen the second half of the month—so we still have time to believe in Santa,” explained LPL Senior Market Strategist Ryan Detrick. As our LPL Chart of the Day shows, December is historically a strong month that has tended to see the majority of its gains late in the month. What could spark a Santa rally? It very well could be today’s Federal Reserve Bank (Fed) decision on interest rates. For more of our thoughts on that, please read this recent blog.